Laminate Vs. Hardwood Flooring - Which One to Choose? Laminate Vs. Hardwood Flooring – Which One to Choose? Wooden floors can get pricey. But when you have to decide between laminate and hardwood flooring, the former gets a nod ahead of hardwood floors. Laminate floors are made of composite wood that is pressed together at very high temperatures. It is the image of the hardwood that is placed on the composite wood, and that is how the laminate floor is made. Both the materials and the installation are cheap for laminate floors. Hardwood floors, on the other hand, are made of harvested trees. The pricing of these floors depends on how exotic the trees are going to be. Their installation cost is also higher than laminate floors. When you have decided to opt for wooden floors, you need to keep in mind that they require regular maintenance. These are not concrete floors which you can use as much as you want. So, when it comes to repairing the floor and maintaining it from time to time, hardwood floors will be easier than laminate floors. You can get a refinish on these floors by sanding the imperfections. They are easy to repair, and maintenance is also easier. However, laminate floors cannot be repaired quite easily. 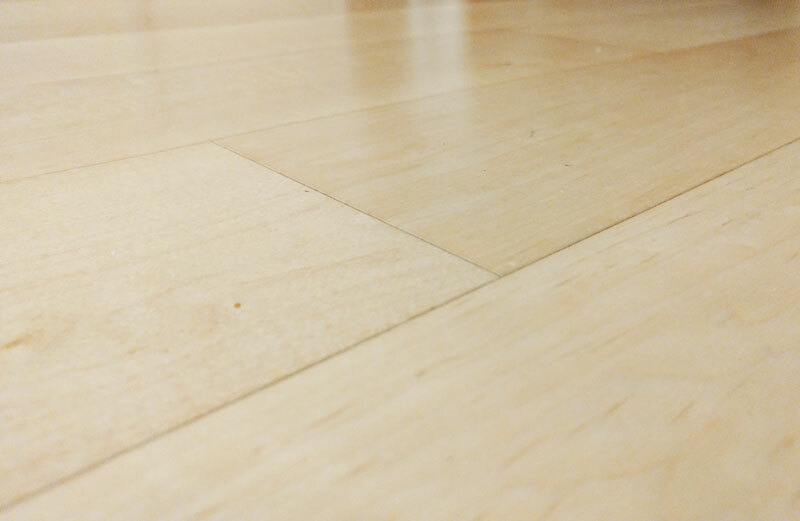 There are times when you have individual boards covering a significant portion of the floor, and if there is something wrong with that part, you may have to replace it altogether. You also have the risk of not getting the exact piece of laminate for the floor. So, things can take a wrong turn if there is anything wrong. The ideal way to choose between laminate and hardwood flooring is by understanding the traffic in your house. You will want a durable surface so that it can last for years. And, when that factor comes into play, it is the laminate floor that will have the edge over hardwood floors. Since laminate floors are made from pressed wood, they can handle a lot more traffic. This makes them more durable than hardwood floors. In fact, they can resist scratches, absorb the regular wear and tear, and moisture too. Hardwood floors are more susceptible to scratches. You need to very careful about spilling water or any liquid because it can get damaged when there is excess moisture around. Moreover, it is not the flooring option for houses that have high traffic all the time. There is undoubtedly a single winner for this one, and that is hardwood floors. They look gorgeous! If you are one of those, who believe in the visual appeal rather than the durability or maintenance, then this is the flooring option that you should install in your house. Not that laminate floors look too dull, but they are nowhere close to what hardwood floors offer regarding beauty. The more you spend on hardwood floors, the better quality wood you will get, and that will increase the overall look of your room. So, it all comes down to your preference and how you use the floors. If you don’t have kids in the house and you want luxury instead of convenience, then hardwood floor is the way to go. Or, if you are looking for a pocket-friendly option that will last for a long time, then you need to go for laminate floors.